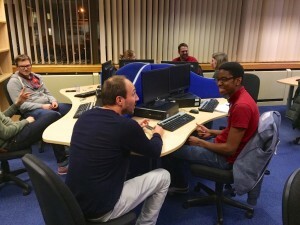 There’s always a great atmosphere and discussion at Agile Staffordshire whenever we have a guest speaker. February did not disappoint. Craig Judson (Operations Manager at Codeweavers) presented Kanban in general and then elaborated on how Kanban is utilised specifically for continuous delivery of software. Subsequently, a vibrant and energised discussion took place on working practices and project/product management. It was great to have such a varied mix of disciplines and roles present to contribute; consultants, developers, academics and managers. It was particularly interesting to note how various people were adapting well-known techniques to their work place and teams. Craig Judson gave a presentation on Kanban and how it is used to deliver software at Codeweavers. Also in February, Rosie Anderson and Rebecca Mycock stopped by to introduce Outsource. While Agile Staffordshire is primarily a group to share experience, expertise and good practice it is useful to network and learn about jobs, careers and opportunities in the Industry. I am sure that we will welcome them again at some point in the near future. Students may wish to pay attention to our blog for news concerning graduate recruitment (as well as all of the great professional experiences they can learn about). Thank you, Rosie and Rebecca! This month we welcome Mr Craig Judson from Codeweavers Limited. Codeweavers are a local company, based just outside Stafford in Dunston. They adopted agile techniques in 2007, starting with Scrum and have continued to evolve their agile techniques ever since. Following graduation from Staffordshire University School of Computing, in 2006, Craig joined Codeweavers as a developer and has since progressed to become an Operations manager. He has previously spoken at international conferences and BCS meetings. University is only the first step! As I’m sure you’ll agree, some of the topics could be controversial! Come along and see a hands on report. This month we will (finally) kick-off the Alien Invasion project. The repository is a GIT repository and can be found at https://github.com/agilestaffordshire/Alien-Invasion-Coding-Challenge . To work on the code, begin by forking the repo and checking it out to your local machine. If your are not familiar with GIT there are some excellent resources at the GIT documentation pages, GitHub and a number of courses at Code School. An AgileStafforshire organisation has been set up at trello. Please set up an account and pass on your account name or email address to be added to the group. Definition of initial goals – Where to begin and where do we want to go? Code review – It would be useful to familiarise yourself with the code before the meeting. Characterisation tests – Can \ should we wrap the existing code in tests to avoid regressions? At last months meeting, due to technical problems, we didn’t get round to the Minisculus Challenge. However we did discuss the idea of extending the Alien Invasion project. The catalyst of this project is that back in June one of the ideas was that we should work on a project together. When we first tried the Alien Invasion we found that, due to a dependency on a client side library, participants were constrained to a .net implementation. In the discussion following there was a consensus that it would have been better for the clients to be language agnostic. To refactor the code so that it can be used via any web enabled language. It was agreed that Kanban would probably be a good fit for our project management needs, as it doesn’t specify fixed iterations. Additionally a number of the group, while being aware, have not used Kanban “in anger” so it was decided that this months session would be an introduction Kanban. By happy coincidence Ash Moran is running a getKanban session at madlab in Manchester on the 24th November. I’m very pleased to say that Ash has agreed to come in and run the “short” game play session for us. I will be going to the Saturday MadLab session and at the time time of writing there are still places available, join us if you can.